"Fear will keep the local systems in line." Last April, the release of the Rebel Transport Expansion Pack marked the introduction of the Epic Play format to X-Wing™. Permitting the use of the GR-75 medium transport and other huge starships too large for Standard Play, X-Wing Epic Play raises the stakes of your Star Wars space battles. 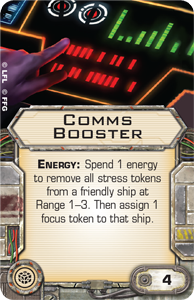 Even as your starfighters weave through asteroids, trying to acquire target locks, and blast each other to smithereens, you and your opponent can also field the sort of ships used to transport stolen plans, conduct diplomatic missions, and carry troops to or from embattled planets. In many ways, X-Wing Epic Play features everything that a Star Wars fan could hope to find in a miniatures game: fast-paced action, dramatic turns of events, iconic heroes and villains, exquisitely detailed miniatures, and large-scale campaigns that immerse you in ongoing struggles of immense scope and purpose. 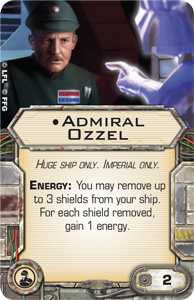 Still, since last April, many players felt there was one key, missing element – an Imperial counterpart to the Rebellion's huge ships. Now, however, we draw closer to the arrival of that first Imperial huge ship. 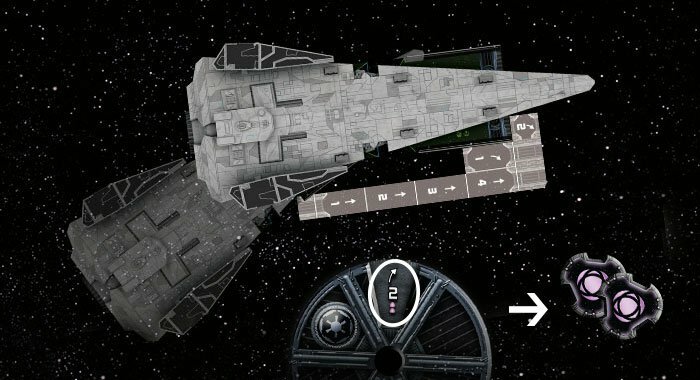 Announced last December, the Imperial Raider Expansion Pack will soon allow Imperial players to engage Rebel fleets in Epic Play the way that they long believed they should, not just with swarms of TIEs, but with a massive, intimidating presence and overwhelming volleys of laser fire. Along with the changes to the rules for huge ships' primary weapons introduced in the last Huge Ship Rules (pdf, 9.9 MB) , the Raider-class corvette and its many upgrades are bound to reinvent the way that players approach Epic Play. Soon, the Rebels will no longer enjoy the largest ships in X-Wing. Soon, the Rebels will learn to fear the might of the Empire! At one-hundred squad points, the Raider-class corvette is the game's largest, biggest, and baddest ship to-date. 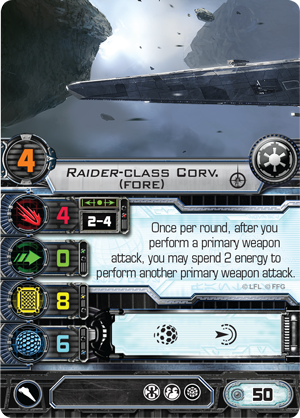 In fact, the Raider is so large that it requires two bases and is divided between two sections, fore and aft , as are its upgrade bars, action bars, and damage decks. It boasts more total shields and hull than the CR90 corvette, and it can perform up to two attacks each round with its primary weapon, worth four attack dice each, to make short work of enemy ships caught at Range 2 – 4. 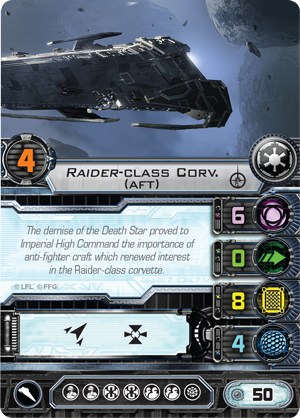 Of course, the Raider is also heavily customizable, boasting three hard points and slots for two crew and three teams. Furthermore, the Raider, like the Rebellion's huge ships, can gain and spend energy to fuel a wide variety of powerful effects. Each round, your Raider gains energy during its activation, equal to the number of energy icons revealed with its chosen maneuver. For example, the Raider would gain two energy while performing a bank maneuver at speed "2," but it would instead gain three energy if it were to fly straight ahead at speed "1." The Raider performs a speed "2" bank maneuver and gains two energy. 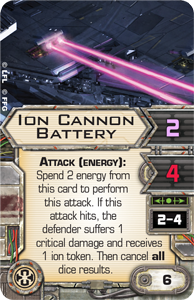 It can then spend this energy to fuel any effect on an upgrade or damage card with the Energy header, such as an Ion Cannon Battery or a Comms Booster . Any remaining energy can be saved or spent to recover shields or to allow the ship to fire its primary weapon a second time. Altogether, this means that you can bring an astonishing measure of firepower to bear against a single enemy, especially if you can catch it in the sweet spot where your fore and aft firing arcs overlap. 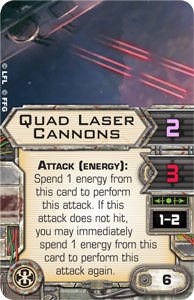 Two shots from a four-attack die primary weapon, one from your forward-mounted Quad Laser Cannons , and two from a pair of aft-mounted Ion Cannon Batteries? That's more than enough to cripple the Millennium Falcon or pretty much any other Rebel ship. 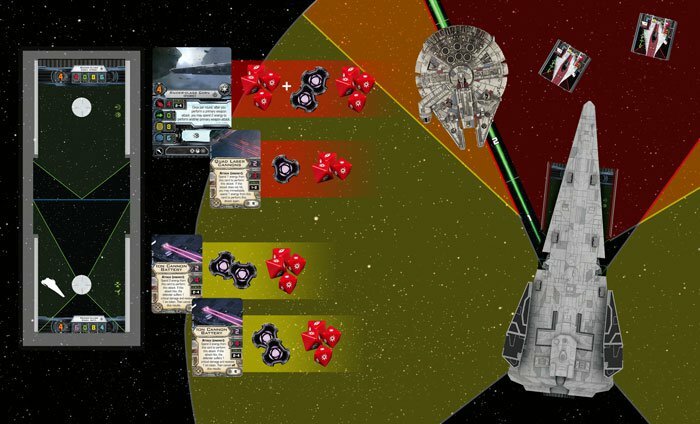 An Imperial pilot catches a YT-1300 in the Raider's sweet spot, where its firing zones overlap, allowing it to fire twice from its primary weapon and then three times from secondary weapons, for a total of seven energy and nineteen attack dice! 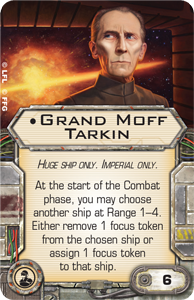 Still, it's not just a matter of raw firepower and resilience that the Raider brings to your Epic battles; the Imperial Raider Expansion Pack also allows you to field such noteworthy Imperials as Grand Moff Tarkin , Captain Needa , and Admiral Ozzel . Each of these iconic characters appears as a crew upgrade in the Imperial Raider Expansion Pack. 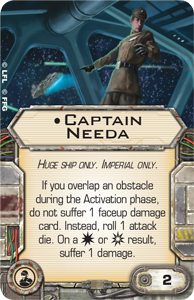 As befits these officers, they come with unique abilities that allow you to exert profound influence over your ship, your fighters, and even your opponent's fighters. With these new officers, you can strip away your opponent's focus tokens or add them to your fighters, you can take new risks with your shields, and you can adopt new tactics or even entirely new strategies in the course of your Epic X-Wing battles. It may not be the Death Star, but the Imperial Raider is, at least for now, the ultimate power in the X-Wing galaxy. 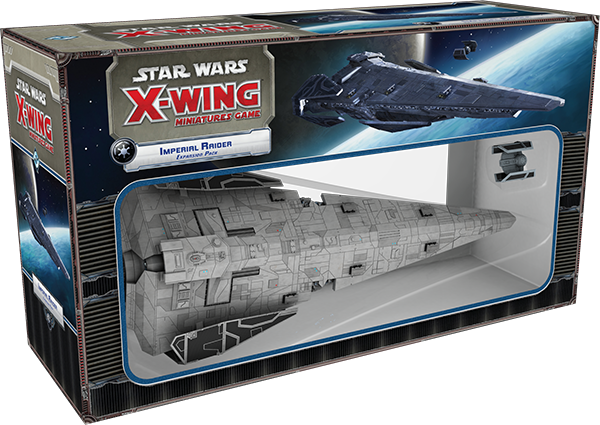 It's bigger and tougher and harder-hitting than every other X-Wing starship, and it's bound to add another truly epic dimension to X-Wing Epic Play. At last, the Empire will have its huge ship. At last, it will have the firepower and battlefield presence it has long awaited. The time is fast approaching. Prepare for your Epic battles today. 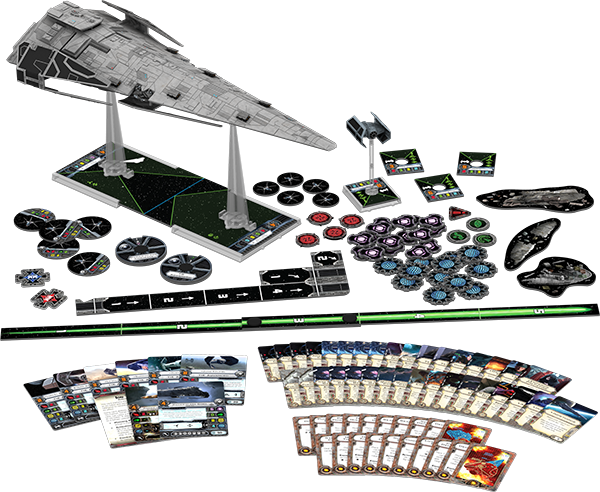 Head to your local retailer to pre-order your copy of the Imperial Raider Expansion Pack!